Keith Rupert Murdoch, AC, KCSG was born on 11 March 1931, in Melbourne Australia, and is an Australian-American businessman and entrepreneur, in particular a media mogul, the founder, Chairman and CEO of global media holding company News Corporation. 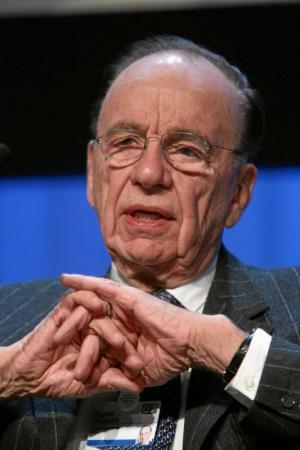 Murdoch inherited a relatively small newspaper group in 1952, which he has succeeded in placing as one of the largest media corporations in the world in 2015. So just how rich is Rupert Murdoch? The most recent estimates by Forbes magazine in 2015 put Murdoch’s personal wealth at over $14.3 billion, accumulated over more than 60 years in the media and entertainment industries. This amount puts Rupert well inside the top 100 richest people in the world. Rupert Murdoch is the son of Sir Keith Murdoch – famed war correspondent, journalist, and newspaper and radio station proprietor – and Elizabeth nee Greene. He was educated at Geelong Grammar, before graduating from Worcester College, Oxford in 1953 with, finally, an MA in Philosophy, Politics and Economics (PPE). ‘Finally’ because his father died in 1952, and Rupert was expected to take over the family business. His father had initially gained fame by exposing the ineptitude of very senior officers conducting major World War One campaigns, particularly on Gallipolli and on the Western Front, and then by working his way to senior positions in the newspaper industry. He eventually acquired several publications, and left Rupert to takeover what had become News Limited – based on the “Adelaide News” – and of which he became managing director on his father’s passing, although most of Sir Keith’s estate – valued at less than $1 million at that time – was needed to settle various outstanding debts and duties. Over the next decade, Rupert Murdoch acquired mostly provincial newspapers in almost every Australian state and Territory, culminating in the purchase of the Sydney “The Daily Mirror”, an afternoon tabloid, in 1960. Looking outside of Australia, in 1964 he gained control of “The Dominion” newspaper in New Zealand , figuring that if Lord Thomson, the British-Canadian newspaper magnate, was interested, then it must be worthwhile. These forays around Australasia contributed significant amounts towards building-up Murdoch’s net worth. With growing influence, Rupert Murdoch launched the first national Australian newspaper – “The Australian” – in 1964, moving its base to Sydney which is the business capital of Australia. To control a morning tabloid He bought Sydney’s “The Daily Telegraph” from fellow media mogul Sir Frank Packer in 1972 – both these moves proved very successful, adding further to Murdoch’s wealth, and thereby his ability to expand further. Naturally, influence was also needed at the political level when Murdoch was creating a media empire, so he was careful to court favour with such leaders as John McEwen on the right, and Gough Whitlam on the left, in the late 60s and early 70s. However, his thoughts were already turning to broader horizons. As a start, Rupert Murdoch had already bought “The News of the World” – a Sunday newspaper – and “The Sun” in the UK in the late 60s, improving efficiency considerably by using the same presses for both. He then acquired the influential, but flagging in circulation, “Times” and “Sunday Times” from Lord Thomson. All publications continued to run relatively successfully once under Murdoch’s management, in particular with him outwitting perpetrators of industrial action when he introduced electronic methods of production. Again he was known to support political figures who were open to persuasion, to his own gain, including Prime Ministers Margaret Thatcher and John Major on the right in his battles with the unions, but then Tony Blair on the left. There is no doubt that there were elements of mutual benefit in these liaisons, not just financially to boost Murdoch’s net worth further, but also strong support of the three aforementioned prime ministers by Murdoch certainly assisted their respective election victories in the 1990s and early 2000s. Alongside these initiatives, however, the US should certainly not be forgotten. Rupert Murdoch had made his first foray into the USA when he bought the “San Antonio Express News” in 1973. He then published “Star’, aimed principally at the working class, and secured “The New York Post” in 1976., and then went on an ill-advised buying spree acquiring many magazines around the country, which almost bankrupted his Australian operations, the profits from which had been utilised for these ventures. However, yet again Murdoch’s eyes were on wider fields and media interests – he became an American citizen in 1985 to facilitate purchases of TV stations, barred to foreigners. In 1984-85 Murdoch control of 20th Century Fox, and then Metromedia, the TV stations of which formed the basis of Fox Broadcasting Company, which took over total coverage of NFL games in 1993. All the time, Murdoch’s net worth was growing. Back in Australia, in co-operation with Telstra Rupert Murdoch launched Foxtel pay TV in 1996, and concurrently Fox News Channel in the US, both of which were outstandingly successful projects – Murdoch’s wealth appreciated accordingly. In 2003, Murdoch secured a third share of Hughes Electronics, the largest satellite TV company in the US. Not content with that, Dow Jones was acquired from the Bancroft family by Murdoch in 2007, which included such publications as Smart Money, Barron’s Magazine, The Wall Street Journal, and the Far Eastern Economic Review, domiciled in Hong Kong. Naturally, Rupert Murdoch became involved in American politics as part of his influencial standing in the US mass media, and in return for support when it was needed, for example in fending-off anti-trust proceedings. True to form, he supported Hillary Clinton’s bid for a senate seat in 2006, and Barack Obama’s presidential campaign in 2008, but then backed Mitt Romney in the 2012 presidential election – for once the wrong horse. He is known to be a strong supporter of immigration reform in the US, and has a seat on the Council on Foreign Relations. Overshadowed by Murdoch’s dealing around the rest of the world, he does actually have interests in mainland Europe too, including the satellite TV provider Sky Italia, often in conflict with the (private) interests of sometime Prime Minister Silvio Berlusconi. This concern has been moderately successful, as has the addition to Rupert’s net worth. Naturally, Murdoch’s vast operations around the world have caused concern in some circles, mostly in regard to his enormous influence through his publications and TV news channels. However, editorial content of these outlets is known to be generally independent of Rupert’s inteference or influence, regardless of his personal opinions. One might wonder whether Rupert Murdoch has any time for a personal life, but actually Rupert has been married three times. He was married to Patricia Booker from 1956-67, and they have a daughter, Prudence. Rupert was then married to Anna Mann from 1967-99, and they have a daughter Elizabeth, and sons Lachlan and James. His third wife was Wendi Deng, from 1999-2013, and they have daughters Grace and Chloe. Since March 2016 Rupert Murdoch married to former model Jerry Hall, a week short of his 85th birthday. All off-spring have some involvement in the family business, in particular Lachlan appears to be Rupert’s heir apparent, and James is also high in management of various arms of the Murdoch empire. Rupert is slowly releasing overall control of his myriad of businesses, and divesting responsibility among his children, and professional managers. Rupert Murdoch was rewarded for his services to the communications industry with a Companion of the Order of Australia in 1984. 1 There is a huge lack of balance in UK media with 8,000 BBC left-wing journalists far outnumbering all national print journalists. 2 [on the BBC] A massive taxpayer-funded mouthpiece for tiny circulation leftist Guardian. 4 The socially mobile are portrayed as uncaring; businessmen as crooks; money-making is to be despised. As a result, in the values it exudes, British television has been an integral part of the British disease, hostile to the sort of culture needed to cure that disease. The fact that those who control British TV have always worked in a non-market environment, protected by public subsidy and state privilege, is a major reason why they are innately unsympathetic to markets and competition. 5 Much of what passes for quality on British television really is no more than a reflection of the values of the narrow elite which controls it and which has always thought that its tastes are synonymous with quality. 6 I believe in competition. The way to control the market is to have competition. If someone goes bust, too bad. 7 Our underlying philosophy is that all media are one. 1 Having announced his January 2016 engagement to Jerry Hall four months he and Jerry confirmed the rumors of their relationship, he married his fiancée at the Spencer House on March 4, 2016. 2 Initiated Sky News and Fox News. 5 His mother, Dame Elisabeth Murdoch, passed away at age 103 [December 5, 2012]. 6 Ex-uncle-in-law of Anna Torv. 7 On the The Big Bang Theory (2007) episode, The Big Bang Theory: The Large Hadron Collision (2010), Sheldon calls Murdoch a traitor because, "He owns FOX and they canceled Firefly (2002). 8 He personally asked Fox Searchlight to release Snow Flower and the Secret Fan (2011) in North America. 9 He was awarded the Australian Centenary Medal in the 2001 Queen's New Years Honours List for his services to the media both in Australia and internationally. 10 On the prospect of Murdoch acquiring the Chicago Sun-Times, where daily columnist Mike Royko shifted from the Chicago Daily News following its demise, Royko famously said "no self-respecting fish" would allow itself to be wrapped in a Murdoch paper. With Murdoch's acquisition of The Sun-Times, Royko shifted employers again and wrote his column for the Chicago Tribune. 11 He was awarded the A.C. (Companion of the Order of Australia) on January 26, 1984 for his services to journalism and media in Australia. 12 Played himself in an episode of The Simpsons (1989), introducing himself as "Rupert Murdoch, the billionaire tyrant", and was lampooned in several other episodes of the show. 13 Has one daughter, Prudence (born in 1958), from his first marriage. 14 Studied politics, economics and philosophy at Worchester College, Oxford University. 15 Twentieth Century Fox, which his company owns, itself owns a partial share of Metro-Goldwyn-Mayer and United Artists. United Artists's signature series, the James Bond films, featured a character based on Murdoch in Tomorrow Never Dies (1997). 16 His two young daughters from Wendi Deng have "playtime sessions" with Hugh Jackman's two adopted children in New York. 17 Father with Anna Maria Torv of Elisabeth Murdoch, Lachlan Murdoch and James Murdoch. Father-in-law of Sarah Murdoch. 18 When he went on a buying spree of Australian newspapers, he was given the derisive nickname "Koala Kong" by his critics. 19 Although a capitalist and supposedly conservative, Rupert Murdoch supported Senator Hillary Clinton (D-NY), as was mentioned on FOX News. The Aussie-American media baron who created the Fox News Channel in 1996 as a conservative counterpoint to what he considered the liberal Cable News Network (CNN), founded by outspoken liberal media baron, Ted Turner, in 1980. 20 In November 2003, he made his younger son James (then 30 years of age) the chief executive of BSkyB, of which he himself is chairman and the biggest shareholder (34.3%). Until then, his older son Lachlan Murdoch, deputy chief operating officer at News Corp. and head of the New York Post and the company's television stations) had seemed to be the heir apparent. 21 Born to Australian newspaper publisher Sir Keith Murdoch (1886-1952) and his wife Elisabeth Greene (born in 1909), he has three older sisters. 22 Owned the Los Angeles Dodgers baseball franchise from 1998-2004, which he purchased from the O'Malley family. 23 Daughters with Wendi: Grace Helen (born on 19 November 2001) and Chloe (born July 17, 2003). 24 Is the CEO and majority stock-owner of Newscorp., a public company which owns several major media enterprises, among which are the FOX broadcast network, the Fox News Channel , 20th Century Fox Film Corp., The New York Post, Reganbooks and HarperCollins Publishers, the BSkyb satellite company, The London Times, and many others around the world.